Pedal problems hit the right-hand-drive Toyota Aygo and Yaris (shown) in 2008. MUNICH -- Toyota Motor Corp. has been dealing with defective accelerator pedals in Europe since December 2008, according to The Wall Street Journal. The world's largest automaker plans to recall vehicles in Europe to fix the problem pedal, but a Toyota Motor Europe spokesman declined to comment on reports that the recall will affect 2 million vehicles in Europe. The models and exact number of potentially affected vehicles are under investigation, Toyota Europe said in a press release on Wednesday. A Toyota official in Japan had said earlier that about 2 million vehicles in Europe are believed to be equipped with the faulty mechanism. Toyota said it would not stop production in Europe because Toyota already has changed its production process to use different components to deal with the problem. According to the Wall Street Journal, Toyota first identified problems with the accelerator pedals on the Tundra pickup in March 2007. The company determined that the problem was caused by the material in the accelerators' friction lever and made a change. Beginning last October, Toyota became aware of sticking accelerator pedals in the U.S. and Canada. The company realized that the material used in the gas pedals was the same as in Europe, prompting last week's recall, according to Toyota's submission to U.S.'s National Highway Traffic Safety Administration. Toyota last weekend announced a recall of 2.3 million cars in the United States to fix accelerator pedals that are prone to stick. 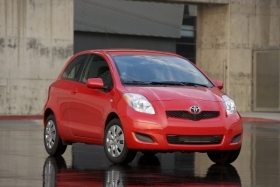 Late Tuesday, Toyota said it was suspending sales of eight U.S. models due to the faulty accelerator pedal mechanisms. The sales halt will be followed by a production shutdown next week at five North American plants. Last year, Toyota and its Lexus division sold 882,351 vehicles in Europe including Russia and Turkey, down 20 percent on the previous year. The company's European production in 2009 fell 26 percent to 517,579 vehicles. CTS Corp., a company based in Elkhart, Indiana, manufactured the accelerator pedals involved in the U.S. recall. CTS said on Wednesday that it is in talks with Toyota about a remedy for the problem. BLOG: If it's not quite the truth, Toyota, what is it?